Held immediately after a domestic Game of Thrones saga that lasted into the early morning, our poker players surprised us yet again coming in throngs and none the worse for wear. Plenty of familiar faces and ex-champions graced LWPS this weekend, many of which represented their partisan factions of the sporting nature this time. Special arrangements were made to accommodate the diehard football fans among us to broadcast the big game between Man Utd and Liverpool on Saturday. A rout of the beer consignment happened again this season, making it our first ever back-to-back clearance of beer stock, always a harbinger of great poker to come. A total of 54 players outskilled, outlucked and outlasted the rest of the Day 1 field of 210. Among the Day 2 runners were five former LWPS kings (champions) in the form of Liew Kok Kong, Muhd Dasreen, Ho Bao Qiang, Chua Koon Yuan and Freddy Kwek, all naturally eager to win it for a second time. With 27 places paid out, it meant only half the field needed to be culled before being in the money. The short stacks were quick to make their moves in the first few levels and the field was whittled down to the final table in timely fashion. 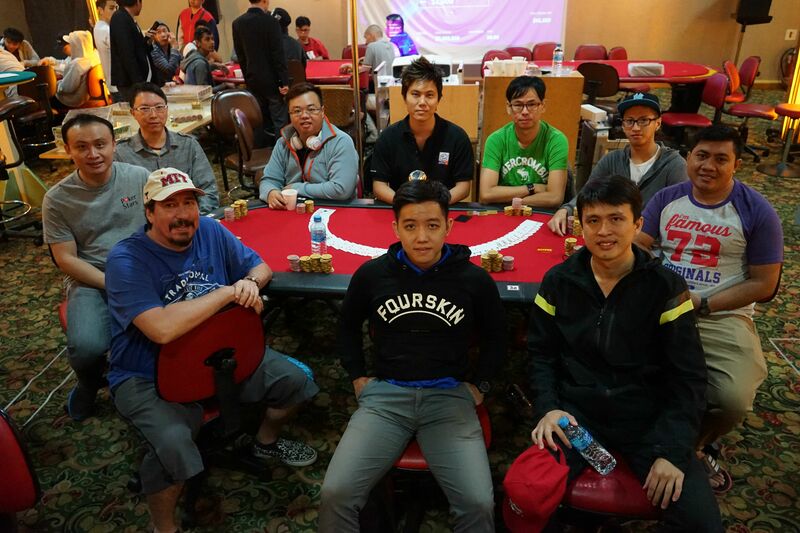 LWPS stalwarts Peter de Groot, Liew Kok Kong, and overnight chip leader Lim Kian Seen were among the notable victims falling short of the final table. The possibilities of a second repeat champion remained high with 3 former champions at the final table, and despite the chip lead of Jason Ng (380k) and verve of young upstart Jordan Ek, they jumped straight into action with agression. Koon Yuan drew first blood when Robert made a stand with his Kc9h on a board of Qd 10d Kh, only to hear Koon Yuan’s snap call with the immortal nuts Ad Jc. Robert could only hope for a tie at this point but the board ran an inconsequential 8s and 4s, knocking out Robert in a respectable 9th place. Dasreen was quick to keep up with the action and found himself in a three-way pot with Koon Yuan and Peter Law, the at-risk player. Peter let slip a slight grimace when the flop dropped 5d Ac 8h, and was resigned to fate when the turn showed a Jh and river the 10d. 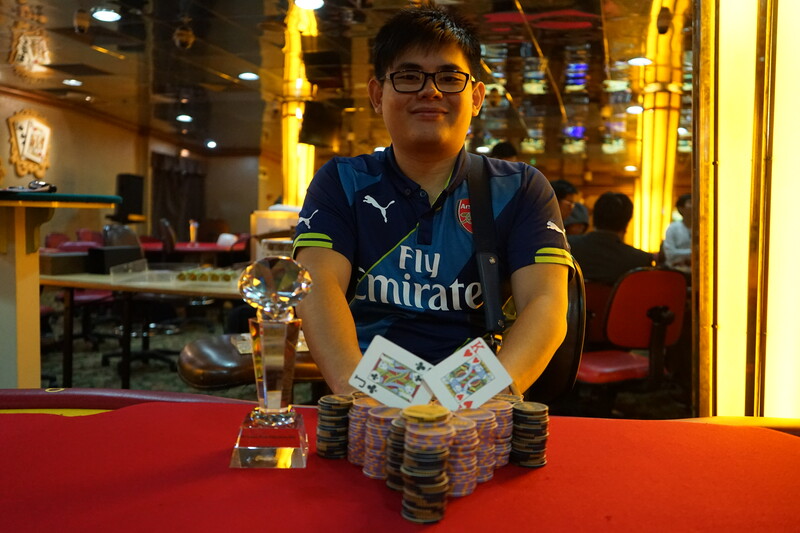 He turned over pocket sevens, which wasn’t enough to beat Dasreen’s winning hand of Ah Qs or Koon Yuan’s pocket kings. Peter exited in 8th place for a decent chunk of change. Not to be outdone by the veterans, new blood Jordan Ek took matters into his own hands with As Ts when the unassuming but solid Ricky Lim shoved all his chips in. Ricky tabled 4c 4h and realized his tournament life hung on a con flip. With a flop of Jh 8c 2s, Jordan shifted uncomfortably in his seat, but the turn spiked the 10h that all but crushed Ricky’s hopes. The river saw the 3s and Ricky left the tournament in 7th place. The very experienced Freddy Kwek managed to hang on to reach the midway point despite not having the favour of the card gods. But alas, he was forced into all-in action with the escalating blinds with 3h 7h against Jason’s Kc 2c. The board ran 2d 5c Kd 4s by the turn, giving Freddy an outside chance at survival with the straight draw, but the river Qc extinguished any hope of the already standing Freddy (6th place). Lots of action transpired with chips moving between players at the 5th place mark with everyone intent on taking the coveted championship. 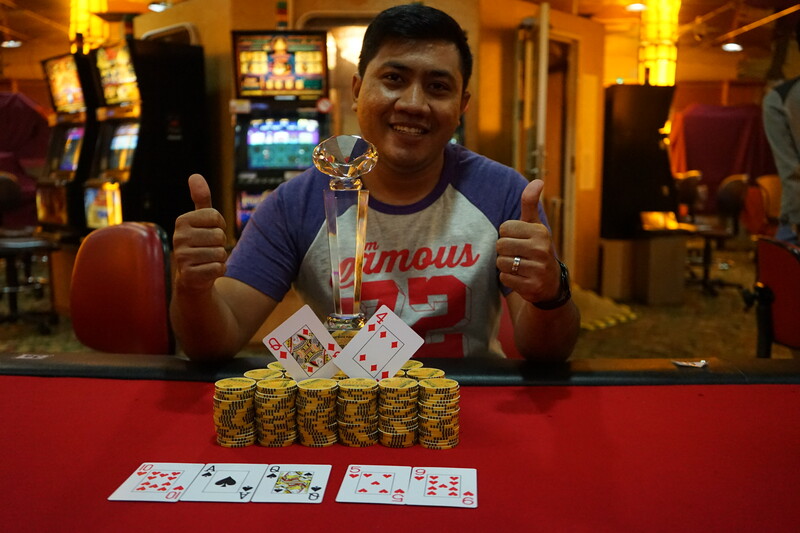 It culminated in a massive all in pot between Jason’s Kc Qd and Dasreen’s As 9s with Jason’s tournament life on the line. The board of 9c10s10d made the impassive Dasreen squirm on the inside with Jason picking up a lot of outs. The turn and river came 2c and 6s respectively to Dasreen’s relief, as we lost Jason in 5th. With a huge chip stack, Dasreen shifted gears and began to take command of the table. Eventually he clashed with Koon Yuan where he was priced into calling with his 8s 5s. Koon Yuan was in good shape going into the flop with his dominating Qs 8d but a dangerous flop of 2d 10s As gave Dasreen a flush draw. It wasn’t Koon Yuan’s day when the turn dropped another spade and busted him out in 4th place. Dasreen’s next target was Jordan when they tangoed in a hand with a board of 4c 10c As 5c. Dasreen called off Jordan’s all-in bet with Qd Td facing Jordan’s 2d 5s and scooped the pot after the Jh river card. Despite ending up in 3rd place, this proved to be an exceptional showing for first-timer Jordan who showed great temperament and composure under stressful conditions. We look forward to greater things to come from him at the next series. Dasreen, who was responsible for half of the final table eliminations so far, went into heads up play against Mick Koh, who was pretty much in survival mode since the start, with a ridiculous 18 to 1 chip lead. Many a spectator expected this to be a foregone conclusion. Even Mick’s body language betrayed him a tad as he tried to put up a strong front against the seemingly unassailable odds. The first of Mick’s all-ins saw him double up with 7d 10d against Dasreen’s 6c 10s. Dasreen collected more outs on the turn needed a non-diamond 5 or 8 on the river to win it on the spot but took a small dent to his chips instead. Mick doubled up yet again on his next all-in with Ks 9d vs Dasreen’s Qc 10d. This time a king on the flop window ensured his survival yet again, much to the chagrin of Dasreen. The third time proved to be a charm for Mick as his Ah 5s dodged all kinds of bullets on the board to double up yet again against Dasreen’s Qd 4d. Dasreen’s chip lead over Mick was dwindled down to being almost dead even, and Mick gleamed at the chance for the mother of all LWPS final table comebacks. After a few more tensely played out hands, Dasreen wrestled back a substantial chip lead after a big pot. That led to a newfound mental resolve equivalent of rolling up one’s sleeves and straightening of collar. The ultimate hand they were embroiled in saw them taking to a flop of Th As Qs. Dasreen pushed all his chips in and Mick paused in contemplation before finally making the call with his Ts 4s, middle pair with flush draw, against Dasreen’s Qd 4d, which removed the remaining 4s in the deck as outs. The turn dropped the 5h and the apprehension further thickened. The river came the 9h and we crowned our second repeat and LWPS XXIV champion in Muhd Dasreen! Congratulations to both players for a fantastic finish to a thrilling final table! The Leisure World Poker Series congratulates all winners, and thanks all participants for making LWPS XXIII the amazing instalment it was. Join us for our Season Finale in a few months!